hard to finish my newest project and within a reasonable amount of time. Wish me luck! Lots of luck! P.S. Put your knife to your wood and let the chips fly! 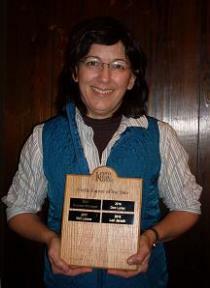 Each year a member is chosen to be designated as "Kettle Karver of the Year"
was added to the plaque and she will keep the plaque until the next election. many members deserved the honor. Foxes/Otter. You can get more information by calling Cedric (920) 420-1225 or emailing him richeson@ameritech.net. meeting due to inclement conditions, the membership will be notified by email or phone. Members are invited to join this group that carves at the Kiel Community Center from 8:30 am to noon on Wednesdays. larmon@tds.net if you wish more information. On January 31 from 9 am to noon, the center will hold an open house. Members will exhibit their woodcarvings and answer questions. Everyone is invited. group are members of Kettle Karvers. compare notes and give encouragement. We will have this open carve after the February 7 meeting. Richard Young, and Jeff See. Congratulations to the winners. members and visitors are welcome. Cost is $1.00. School, 1331 Packerland Drive, Green Bay, WI; Saturday 9:30 am- 5:00 pm, Sunday 9:30 am-4:00 pm; go to newwg.org. 1301 Craig Avenue, Janesville, WI; 10 am-4 pm, rosietom@centurytel.net or 608-868-4522, rockrivervalleycarvers.com. now and make a brand newending.